WikiReadings are Wikipedia pages read aloud to camera verbatim - the human faces of our encyclopaedia. WikiReadings is a new project with enormous scope for development as a tool for education, as an aid to the visually impaired, as another way of sharing the knowledge and enthusiasm for a particular Wiki. It can be an aggregated channel tailored to your interests and listened or watched as you would radio or television. It returns written knowledge to an aural tradition after the Wikipedian treatment of collective editing. It is 'performed knowledge'. It encourages creativity and comment within the 'rules of engagement'. What's so amazing about Wikipedia is the (aim of*), democratic means to gathering and refining the sum of human knowledge. In the spirit of transparency and equality, and the chance of surviving the next 100 years the Wikipedia project is absolutely essential. *Wikipedia is a work in progress. The balance of Western white male editors is a project Wikimedia are trying to address. There are also issues of whole populations being barred from editing Wikipedia due to excessive spamming from those regions. We can tailor a WikiReadings project to suit your event in your school, business, museum...etc. We bring a small camera crew, social media team and invite the students / your public / employees to read an entry to camera following a theme. We then upload the videos and create a playlist. For example a new exhibition about dinosaurs at the Natural History Museum could see prehistory themed Wikireadings. WikiReadings is glad to be part of the Science Museum 'Late' for their new exhibition 'The Information Age'. There's great potential for WikiReadings to work in an educational setting. Students are encouraged to engage with, and / or edit a Wikipedia entry with their performance of the material for internet broadcast to conclude their Wikireadings project. The excitement of performance upping the stakes for learning to express the texts, understanding all the words, debating the meanings and issues, learning attention to detail and accuracy, bringing enthusiasm to what may at first appear to be dry information. A global news channel using the source material of wikinews.org edited by the people for the people. News written, edited and read by the people who are involved in the cases on the ground where they happen. The news unfiltered by the hegemony of elites with financial agendas. We have devised ideas for how this could work. Pieces could be read by an actor who can give the words appropriate intonation yet infuse some subtle drama to bring it alive, on a 'set', and the text becomes performative. Scenarios could include a Jackanori type setting with the reader performing the entry (about Charles Dickens' Oliver Twist), like a bed time story with the reader sat in a dimly lit Edwardian reading room armchair. A scientist working in the field who reads the page about Leaf cutter ants as a line of them march past carrying their cut leaves. Equally - an entry recorded on a old laptop camera on a untidy background where the WikiReader delivers the words with passion and excitement. Radio techniques can also play a strong role in this as much as video with only the sound of waves as a reader explains the workings of the sea. And a clear engaging reading voice can be enough to hold the listener. 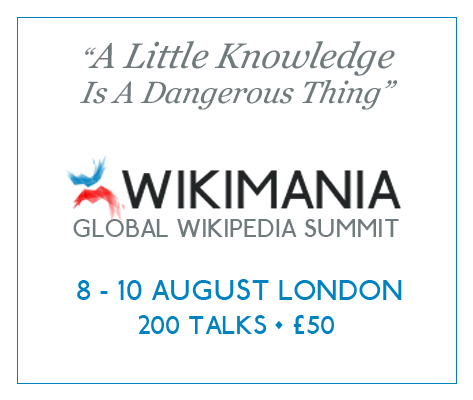 To inspire interactivity with Wikipedia and WikiReadings a celebrity or expert of a field is lined up to read a page entry on a particular announced date. The public and other experts are then invited / encouraged to read the material on Wikipedia leading up to the reading date, and edit it if something is missing or incorrect. For potentially controversial entries such as Palestine, or Euthanasia, or current affairs related topics it could get people really trying to examine the issues and talking about it with a reading deadline looming. Yes we would like to develop the project. Henrik G Dahle is an artist, writer, creative, ideas person who lives in London. He works with a number of volunteer / collaborators. 'I had the idea some years ago when I read a page about LeafCutter Ants to my brother and we both found it surprisingly engaging. We knew there was something in it'. Editing is permitted so as not to limit the creativity of the WikiReading team. Although it is essential to preserve the authenticity of the content. The Wiki community would be required to moderate the reading for accuracy to the content and guidelines of WikiReadings. The videos and audio should be time stamped given the evolving nature of Wikipedia. Videos and audio pieces to be flagged up as out of date when a page has been edited. The reader could be free to comment on the content during or after their reading, as long as they make it clear it is their own opinion / thoughts. There could be facility for listeners to comment on the hub website. Comment on the reading itself or the content. This first outing of WikiReadings was a great success where we discovered new ideas and expanded the concept. We would like to thank Gaelle Berton, Leonie Sinden, Charlie Southwell, Edward Saperia and all the WikiReaders who joined us for the first recordings. - Choose a Wikipedia page that interests you. You can read an extract or the whole article. - You can read from any language Wikipedia. - Read your page to camera. Introduce the article. You can introduce yourself and why you wanted to read this particular article. Engage us! Bring the words to life. - You can comment on the entry so long as it is clear these are your own comments. - Until we (or Wikipedia) have a system for receiving Wikireadings, -upload your video to your own Youtube channel. Tell us about it and we'll add it to a playlist and tell the world. - Name your film with the title of the Wikipedia page followed by 'Wikireading'. Provide the link to the Wikipedia page in the description. Your film should be dated. - All WikiReadings must be Creative Commons attributed.